A soft Tussar silk that does not crush easily in an elegant brown / black / white is what I decided to wear for the Support Group Meeting in the quietly elegant city of Bhopal . 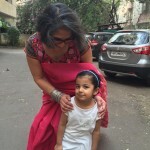 My first visit ever to this city that is known as the City of Lakes and what caught my attention first was the profusion of the brilliantly hued bougainvillea cascading from every available perch ! And how gracious are the people ; kind and full of an engaging old world charm . 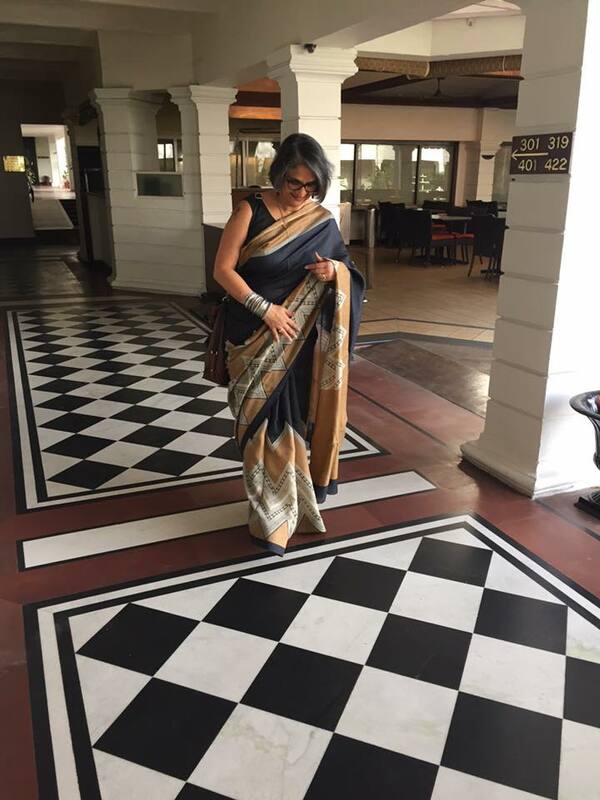 As I stepped out of my room it was hard to miss the manner in which my drape of the day matched the classic flooring of the hotel corridors. Young Osaf , the polite young man at the Reception was kind enough to take my photograph . His name, he said , meant someone who can multi task and that talent was evident . The people who work there love the place and take good care of their guests . Including showing us around some of the heritage suites and packing a breakfast for us as we caught a really early morning flight the next day. The Jehan Numa Palace Hotel whose every beautifully appointed corner and charming ambience spoke of the legacy of the dynamic and progressive Begum Nawabs who ruled with foresight , and even then ensured women in their state were aware of and received their rights . Reminded me of Ahilya Bai Holkar in neighboring Maheshwar. Three Begums who ruled one after another , inheriting from their mother the State and her ruling style . I found the city bustling with a quiet energy and the sad memories of the gas tragedy three decades ago obviously not completely erased but no deterrent to progress . At the meeting I really don’t know where the day went . The patients and their families were already there early in the morning many of them having taken overnight trains to get there . The traditional breakfast of Poha and Jalebis much appreciated . What a joy it is to meet these old friends and the doctors who treat them and put into action a day long event that takes care of all their needs . Sharing of testimonials , medical sessions and interactive workshops . Not to forget posing eagerly and happily for as many pictures (and Selfies of course ) as possible .